On June 19, 2018, Bev Parsons received terrible news of her terminal illness. She was given two months to live. She asked that her daughter put the event on her calendar, so they cut out the article so they would not forget to attend. It was very important for her to attend and make a donation, and she was not going to forget the date and time of that event. The day of the event came, and although Bev was very weak, she and her family went to Cassia Hospital. From her wheelchair, sweet Bev wrote a check for THREE beds! She met the Chapter Presidents and Founders, who were very gracious and had pictures taken with her at the event. That day, she received a bracelet at the event, and as she now rests in Heavenly Peace, she is still wearing that meaningful bracelet. 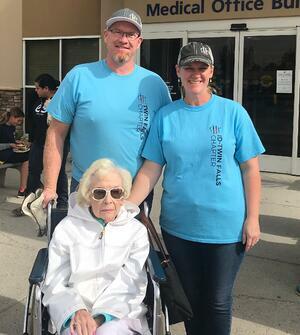 September 29, 2018, the day Bev chose to spend her time helping others, was her last outing. She passed away at home October 15, 2018. The vision of SHP was very important to Bev. She was a sweet, caring, generous woman who loved children and wanted to make a difference in her own way. Through the assistance and dedication of the volunteers of SHP, she did make a difference.